Sorcerer is the best starting class for players who want to use magic as their primary offense tool. In the early game, Soul Arrow is the primary source of damage and with 30 uses it makes the early game easier. Due to the Sorcerer's high Attunement both Sorcery and Pyromancy are viable early on. Using physical weapons will be a struggle, though. Investing into Strength early on allows for the use of other, more powerful and diverse weapons. The Sorcerer's Dexterity is decent, so using spears is also an option. This can provide a good way of dealing with enemies that are resistant to magic. Early on the Sorcerer is easy to play but is very unforgiving, and gets more and more difficult during the mid game. It pays off later on once higher-end spells and catalysts are obtained. Sorcerer max level is 713, the highest max level of all the classes. By choosing the Master Key as a starting gift, it is possible to get the Crimson Set and Tin Banishment Catalyst as soon as the player arrives in Lordran, both of which give the Sorcerer class the best possible start early in the game (see video Beginner's Sorcerer Gear Location Guide for a guide to its location). 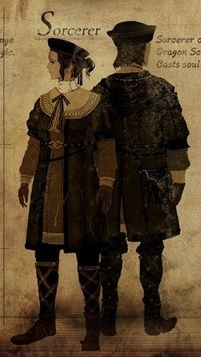 Rickert of Vinheim, the blacksmith found in New Londo Ruins below Firelink Shrine is accessible straight away as well, for 2,000 and 4,000 souls, he sells Soul Arrow and Heavy Soul Arrow respectively. The next Sorcery vendor isn't available until obtaining the Basement Key and Residence Key to free Griggs of Vinheim in Lower Undead Burg. In the mid-to-late game the Moonlight Greatsword can be acquired from Seath the Scaleless in The Duke's Archives which not only scales with Intelligence but also possesses an incredible magic-based special attack (Moonlight Wave). Alternatively, an upgraded a standard weapon (such as a Longsword) ascended to Enchanted +5 (scales with Intelligence) is advisable, or the usage of a weapon with innate Intelligence-scaling like Velka's Rapier. For characters planned to be primarily casters, the focus on leveling Attunement and Intelligence is advised. Attunement will be necessary to carry multiple spells, and Intelligence will increase the damage Sorceries or Intelligence-based weapons cause. Please note that the DLC Dark Sorceries deal physical damage in addition to magic damage, and deal more damage to Stamina and Poise than standard Sorceries. The magic damage of dark Sorceries scales with the Intelligence scaling of the equipped catalyst, and the physical damage scales with the Strength and Dexterity scaling of the equipped catalyst. For PvP, it's worth investing in Dexterity to increase the casting speed of Sorceries, Miracles, and Pyromancies. Due to the fact that casting speed will see practically no increase until Dexterity is at 45 points (35 for slow-cast spells), this isn't recommended for PvE.